Describing herself as “an ordinary person who gets a lot of joy out of giving”, Shirley is excited about seeing her gift to HCF at work during her lifetime. Shirley Elford – a celebrated glass artist known for her stunning Juno Awards sculpture, beautiful angels, one-of-a-kind pieces, and her commitment to the Hamilton community – holds back tears as she describes how she felt when the first grants were made from her fund at Hamilton Community Foundation. When she established The Angel Fund in 2003, Shirley planned to finance it from a life insurance policy in her estate. But this year, she chose to make an outright gift when she discovered she had cancer. 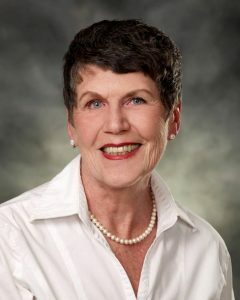 A member of Hamilton Community Foundation’s board of directors from 2001 to 2006, Shirley is a passionate advocate of HCF and many other Hamilton organizations. Her volunteer résumé is as full and varied as her award-winning artistic career – a career that started late. She was already 36 and the youngest of her children had entered high school when she applied to the Ontario College of Art. “ I needed something that was just me,” she says of that time in her life. “I was Bill Sinclair’s daughter, I was a wife, I was a mother. I craved an identity that was just me.” Shirley excelled at OCA and discovered the very difficult medium of glass. Her stunning body of work is proof that she mastered the challenge. In 2010, Shirley created the Gift of Today Fund choosing turquoise, the signature colour for ovarian cancer, to represent the fund’s purpose. This fund supports a diverse array of initiatives that increase the scope and availability of assistance and education both for those experiencing ovarian cancer and for friends, families and professionals involved with their care.